Aviva Alter’s work is concerned with questions and statements that define human nature and experience yet have no certain answer. The materials she uses in her work are familiar to her in that they have been worn by or fashioned after people she knows or has known. 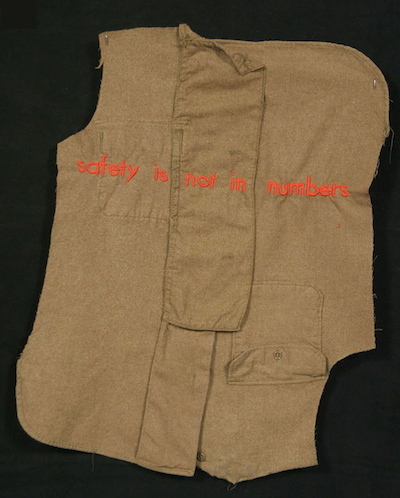 In this installation she uses a shirt worn by her late mother with an embroidered script stitched across the front “how can you measure pain”. With a similar yearning she has made a quilt-like wall piece that states ”exhale one last time” stitched across her own mattress pad that she has pieced together surrounded by narrow strips of a well used white woolen army blanket. These pieces come together to remind us that we can not easily quiet the emotional residue that we long to leave behind. They bear witnessto the reality that our questions are not easily answered.